IA Design was engaged to create a new workplace spanning three buildings of two floors each in Technology Park, Bentley. The project being a refurbishment of our clients existing space, has a staged construction programme. IA Design undertook extensive briefings and space utilisation studies during the project definition phase to understand the requirements of the business, the current culture and desires for the future workplace. The existing workplace provided very few private spaces to support confidential interactions and private conversations or spaces which allowed for focused work. The main drivers for the new project were to provide these spaces and facilities, all of which were to display a consistent design language. IA Design is responsible for all design deliverables for this 6 floor project. Our client is an innovative energy business that is flexible, world class and one that embraces change. Many teams are working agile and have requirements for collaborative spaces to support this mode of working. Custom furniture and built elements including screening were designed to allow for this methodology. A dedicated “Incubator space” was designed which is flexible in size and function and it currently being used in various ways and is proving a successful space which is driving collaboration within the business to new levels. 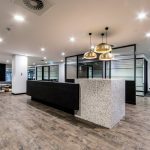 The resulting fitout is a strong contemporary workplace which has raised standards, identity and perfectly reflects our client. All of these great outcomes being achieved well within the budget. A successful project and one which we are proud to have been involved in.